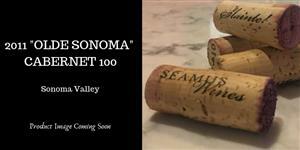 Our Old Sonoma Cab 100 is made of 100% Sonoma Valley Cabernet Sauvignon grapes! Yum! This delicous cabernet was aged for 20 months in French oak barrels. It was produced with Cabernet Sauvignon grapes from the Valley of the Moon's historic Atwood Ranch Vineyard, a 70-acre estate on the site of one of the first bonded wineries in Sonoma Valley. The lush and beautiful land has grown fine wine grapes since the mid 1800's, has seen generations of happy vintners, and has become widely recognized for its quality Cabernet Sauvignon grapes.